On Balance Volume (OBV) helps identify momentum of a trend. OBV is a reflection of volume flowing into or out of a particular security. OBV is calculated via a running total of volume on each bar with a higher close than its previous bar and subtracts from the total the volume of each bar with a lower close. The running net volume total is plotted as a line. The use of both price and volume provides a different perspective from price or volume alone. 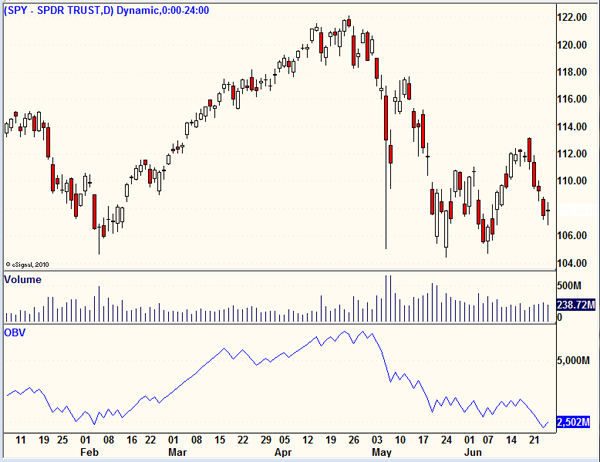 Divergences between price and OBV can signal a sentiment change. For example, higher prices with light volume will cause On Balance Volume to diverge (drop), indicating that the trend may lack conviction. Because OBV begins accumulating values from the left of the chart, the numeric value will depend on the data available in the chart. Therefore, the relative value, or trend direction, of OBV is more important than its numeric value. The OBV was introduced by Joe Granville. On Balance Volume can be a powerful tool for the technical analyst to use, especially when the entry and exit signals that occur are taken in context with the careful analysis of both price and volume of the chart being analyzed.